Located in the ICF South Colony in Anna Nagar, Plusportz is a multi-sports complex and has been built in collaboration with the Integral Coach Factory (ICF). Bringing together experts from different fields, this property is massive compared to other sports destinations, albeit a bit further away from the city. Love all kinds of sports? Then you’ll love this. The sports currently on offer at Plusportz are plenty so you’re going to have a hard time choosing. By visiting their website here, you can book the courts for futsal, box cricket, badminton, volleyball, basketball and even mini basketball! 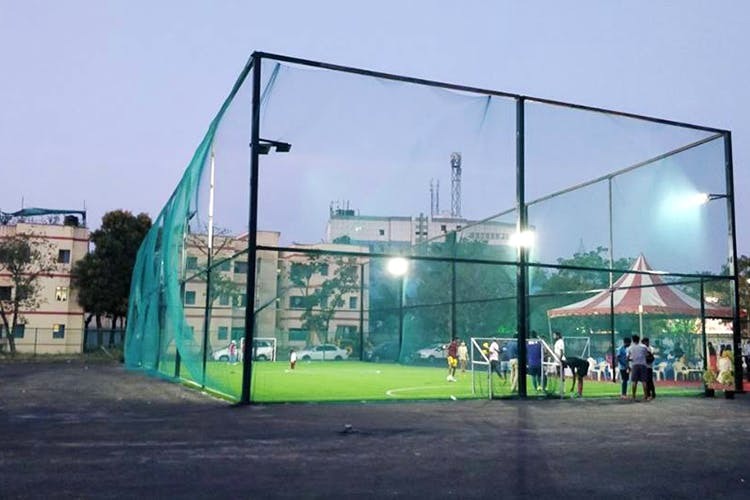 There are three futsal courts and the first thing you realise about these is the length of the turf which extends beyond the spaces in the city. While some may find it narrow, it is not uncommon to find even a 6v6 game happening here! Box cricket can be played inside on these turfs and all the other sports are available on the synthetic surfaces outside. What did I like about this venue? The sheer number of sports that are on offer here and it really doesn’t matter old you are. You have people from all ages playing badminton or volleyball. Surprisingly, the heat doesn’t seem so bad when playing under the shaded nets in the Futsal courts either. So don’t let that stop you! There are five synthetic courts built just opposite the Futsal arena and you can always see a number of sports that are played here in the evenings.Badminton has certainly become very popular in Chennai and it is no different here! The courts are usually filled with pairs of people from all age groups smashing shuttles across the net at each other. Volleyball, which you usually might see at the Elliots or Marina beach and played on sand, is available too! The surface is such that you don’t get hurt either. With make shift basketball rings, you can play a full game of basketball or minis with your buddies. If you think you would like to learn or train in a particular sport, you can reach out to them directly. They are working alongside Sabir Pasha, former Indian Football player and currently Chennaiyin FC’s assistant coach, who is currently conducting a coaching camp for all ages! It doesn’t matter if you are a novice, intermediate or elite player, they have batches for everybody. With big spaces on offer at Plusportz, there have been fitness bootcamps conducted here with an inaugural one by biggies like Reebok. You can inquire about yoga, functional training, roller skating and even paintball! Corporates can do the same for bulk bookings or discounts too! Anna Nagar Has A New Sports Centre And It Is Everything You’ve Ever Wanted!